For better or worse, most companies have purchased financial software from large-scale enterprise resource planning (ERP) platform suppliers over the last decade. But as companies search for ways to lower costs and respond to a difficult business climate, the merits of implementing large-scale ERP platforms have come under closer scrutiny. 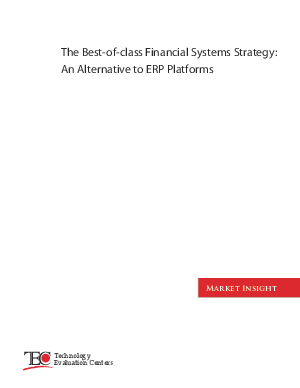 This paper will examine an alternative approach that may be more appropriate and strategically sound for many companies: a best-of-class systems strategy.
. Have ERP platforms grown too unwieldy for some organizations?
. Does ERP make sense for all types of business, especially in today's fast-changing and frugal business environment?
. Are ERP platforms being sold to companies that simply don't need it?
. Have technological advances eliminated some of the reasons for ERP platforms in the first place?
. Is the drive for competitive differentiation causing companies to develop more of their own operational systems, thereby eliminating the value of ERP?
. What does a best-of-class strategy entail, and what are the advantages?